Description: Sexes similar. Olive-brown above, with contrasting fox red tail; whitish below, with streaked throat and blackish-brown spots on breast; and complete whitish eye ring. Behavior: Has nervous habit of flicking its wings and tail. 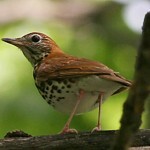 Habitat: Migrants found in dense to semi-open areas of woodland, shrubbery, and viney tangles. 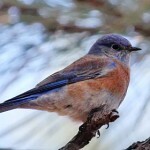 Where in Nebraska: Uncommon spring and fall migrant in east, becoming rarer westwardly. Rare in extreme western Nebraska. 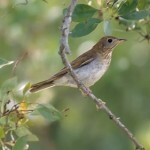 Occasionally Hermit Thrushes are observed in late fall and winter and are the only catharus thrus likely to be encountered during this period. 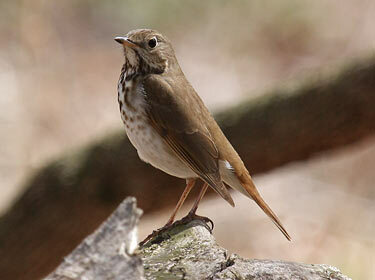 Fun Facts: When it comes to nesting, the Hermit Thrush nests on the ground in the East and in trees in the West.